Some teenagers get driving lessons from their parents. Other teens are taught by licensed instructors. But Malia Obama isn't your average 16-year-old. Her driving lessons were provided by the U.S. Secret Service. So how did Malia learn how to drive? Her mother, first lady Michelle Obama, told celebrity chef and daytime talk-show host Rachael Ray in an interview that it was the armed agents who taught her. The Secret Service provides around-the-clock security for the family. "They wouldn't let me in the car with her," Mrs. Obama said of the Secret Service agents. The first lady was quoted from an excerpt of the interview. The excerpt was released by Ray's program. Mrs. Obama hasn't driven herself in seven or eight years, she said. She added that driving gives Malia "a sense of normalcy." It helps her feel like the rest of her friends who are also driving. In the interview, Ray says that the Obamas seem "so grounded." The first lady replies that her "hope is just to make sure that they (her daughters) come out of this thing as functioning adults, you know?" "She always has security around but in order for her to learn how to drive she had to drive on her own," the first lady said during a separate interview. This was for the show "Live! With Kelly and Michael." Mrs. Obama is trying to let her first daughter live a normal life by letting her drive around, after getting a license, like other teens, if her daughter wants to. Her daughter was taught to drive by a special group called The U.S. Secret Service. Mrs. Obama was referring to life in the White House. 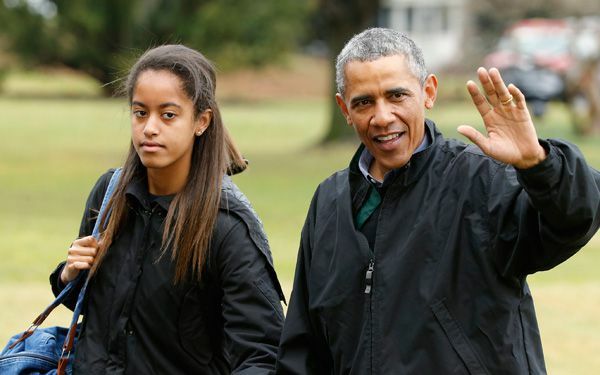 This story is about first daughter malia she got her drivers license . I dont want Presindent Obama to live the witte house because he is the best presidential race. I feel so happy for Malia Obama because obviously, she is very famous and she was taught driving lessons by some kind of secret service agent or something. But I think the most amazing thing about this article is that I have never seen how Barack Obama's daughter looks like. I think that Malia really deserves her driver license because she learned well, and she knows dangers and all the rules of the road and how the car works. Unlike my mom. She tried earning her driver license, but then when she had this big test, she failed because she got three wrong. Critical Thinking Question: What is Mrs. Obama referring to as "this thing?" Answer: She might mean that her daughters would go through this hard work. She wants her daughters to proceed along with their education, learning, and work and then they can finally be successful adults. I think this is a pretty cool story since she learned how to drive from the U.S secret sevice. She is pretty lucky since she has like body guards around her when she is driving but she drives not them.It is really cool that the service taught her that instead of the instructors or people that can teach you how to drive a car . She is referring to her daughter with the drivers test. 1. Because her daughter is taking a drivers test. 2. Her mom and dad is taking her to this test. 3. And the test is a thing that her daughters are doing. Question of the Day: What is Mrs. Obama referring to as this thing? My Answer: I think Mrs. Obama's referring to as "this thing" because in my opinion she wants her daughters to be regular adults nothing like, "Oh my father is a president I have to act like him to I can't relax that much, etc. (other reasons)" Another reason why I think that Mrs. Obama is referring to "this thing" because she doesn't want her daughters to be treated like other people have to listen to them, and like make these excuses that their father and mother are the first man and woman. My final reason why I think that Mrs. Obama is referring to "this thing" because she wants them to be an ordinary adult in the future not someone who is like expecting others to remember them as someone special. That is what I think of Mrs. Obama's referring to as "this thing." I think Mrs. Obama is referring to this thing as being about her husband being the president of the United States of America. They all live in the White House. It has to be a pretty special place to live. The president's girls have special security to always keep them safe. That is different from a normal child. Mrs. Obama wants her daughters to grow up as normal as possible. This thing is the special way they live and the special treatment they are getting in life. This thing means kind of like the word childish. Like how you want your kid to grow up and not just be a kid. Just don't act like you get treated by your parents when your an adult. That is what this thing means. She is referring to how her daughter is not an average 16 year old because since she is Barrack Obama's daughter than she has to go to a special secret service school and drivers license test. I said that because it said that in the middle of the article. I think that she has to do secret services because she is a special kid because her father is the president of the United States.